The Patagonia Capilene 1 T-Shirt was the first technical shirt that I purchased once I decided I was going to pursue the life of backpacking. 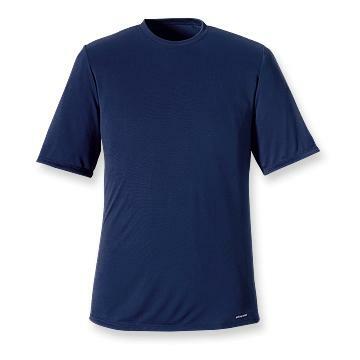 I was drawn to it by both the reviews I had read which raved about the Patagonia products, as well as the soft feel of the actual shirt itself. I was able to purchase this from a local shop rather than have to order it online, so I knew what I was getting in advance. I must say that the shirt has certainly lived up to it’s reputation. It has been a shirt which is soft enough to feel comfy and cool against the skin, but rugged enough to withstand multiple days of carrying 55 lb backpacks, without so much as a blemish. The only thing which I would caution anyone looking to buy this shirt is that it does not control odor. It has a typical synthetic odor after a single days use. You can read my full review of the Capilene 1 T-Shirt here.